After hosting what everyone agreed was the best wedding ever (more of which later), Audun and I had one week to enjoy Norway at its prime. One of the disadvantages of travelling as much as I have in the last couple of years is that I don't get to spend enough time in the beautiful Norwegian mountains. Instead of settling on one area to visit, we decided to keep our options open and follow the weather. This resulted in a lot of driving, but we enjoyed good weather for most of our trip, which is never given in Norway. Here's where the weather took us! We started off the week by staying put. The wedding took place in beautiful Norddal, tucked inside a long fjord arm in western Norway. We decided to tackle Heregga, the mountain in whose shadow we were married. Heregga is a dramatic dinosaur spine that looks impossibly steep from the front. 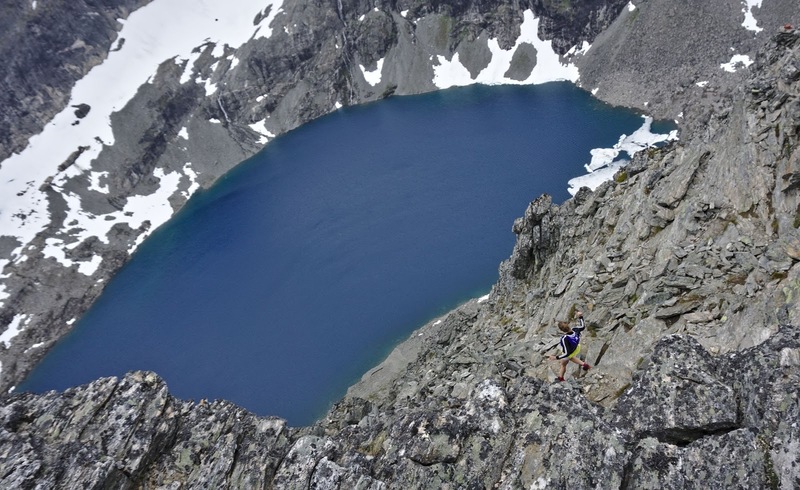 The normal route meanders around to the back of the mountain and takes a relatively mellow route to the summit. We had heard tell of a direct route up the side of the dinosaur spine, and we decided to go looking for it. Our plan was to take the steep route up, then go over the ridge and take the normal route back. Audun poses next to Heregga. Our route took us up the steep chutes on the side you can see hear. Most of the chutes up the side of the mountain seemed to end in steep, slabby rock, but using binoculars we found a strip of green that seemed to extend to the top of the spine. 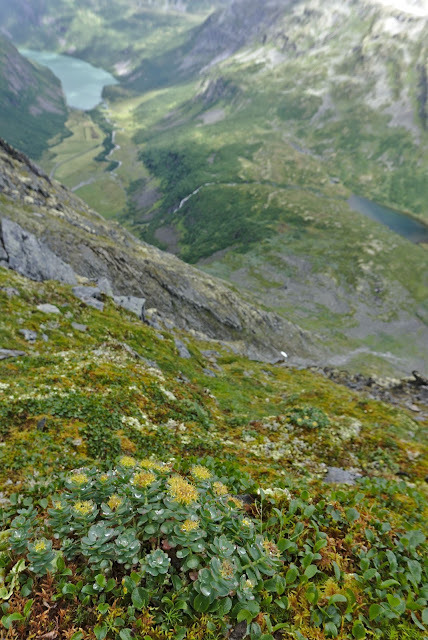 It was a mossy, direct highway to the top of Heregga. And it was VERY steep! The strip of green turned out to be the steepest moss field I've ever seen. It was strange to clamber up squishy moss on rocks, and we joked that we needed to invent a 'bog anchor' for this type of climbing. I hoped that this route would take us to the top and we wouldn't have to turn, since downclimbing steep stuff if generally more difficult that climbing up. 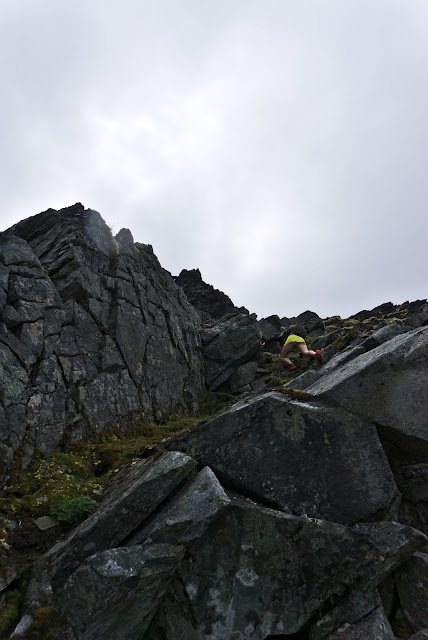 Audun climbs a genuine Norwegian vertical bog. Like magic, our highway of moss and lichen lead us up onto the ridge, and we popped up into flat, relatively safe terrain. Audun poses near the summit of Heregga. 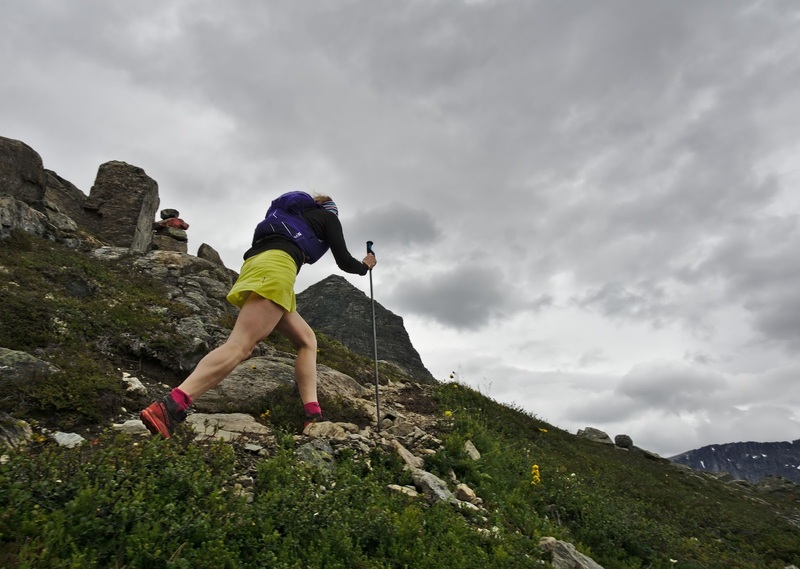 The next day we made inland, driving over ever-spectacular Trollstigen, and I suggested we stop on top to shake out our legs and take in a mountain top. We decided on the short and steep climb up to Bispen (The Bishop), an iconic cone shaped mountain that looms above Trollstigen. The ascent from the road to Bispevatnet (Bishop lake) was a well-worn trail, but soon we were hopping boulder and scrambling rocks, following sporadic red marks. The hike was not for the faint of heart, with vertigo-inducing views of the valley below and lots of time in steep terrain with loose rocks. 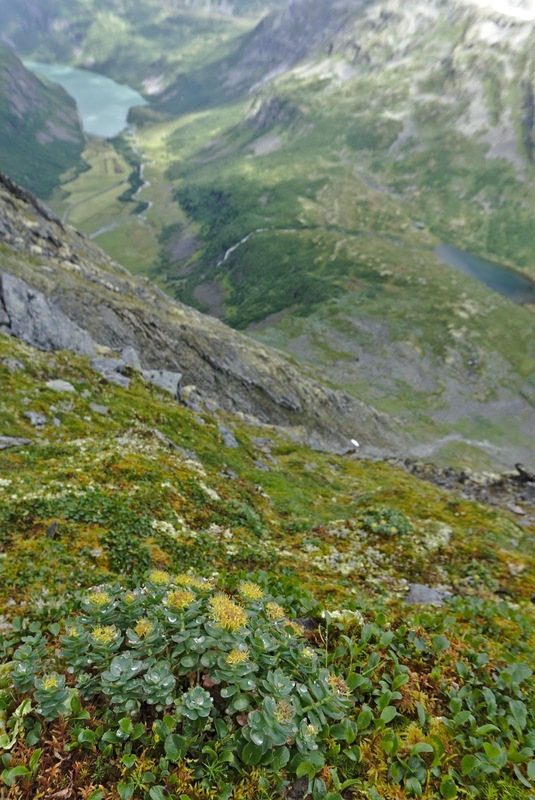 The view straight down to the valley on the way up Bispen. 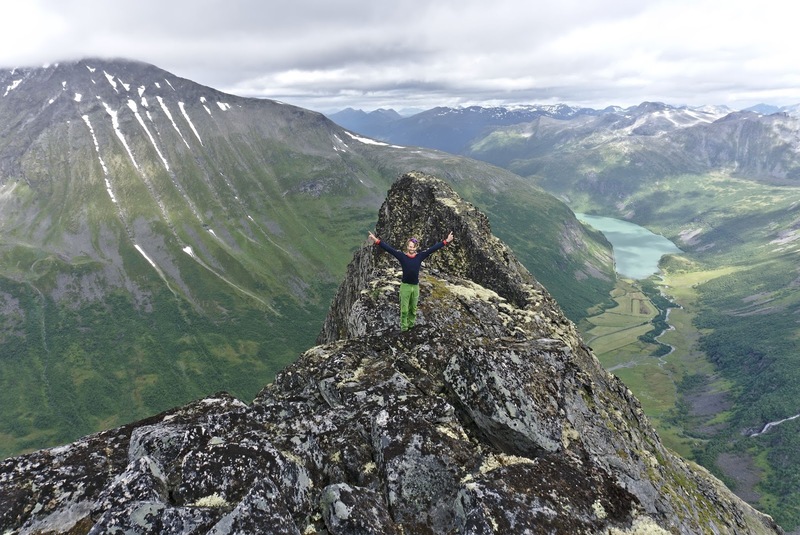 We looked over at Kongen (The King), a nearby peak that is often scrambled in the same hike as Bispen. Somehow it looked even worse, the only obvious path up following an exposed ridge. We would have to save that challenge for another visit, since we had a dinner appointment to keep. Audun near the top of Bispen, with Kongen to the right. 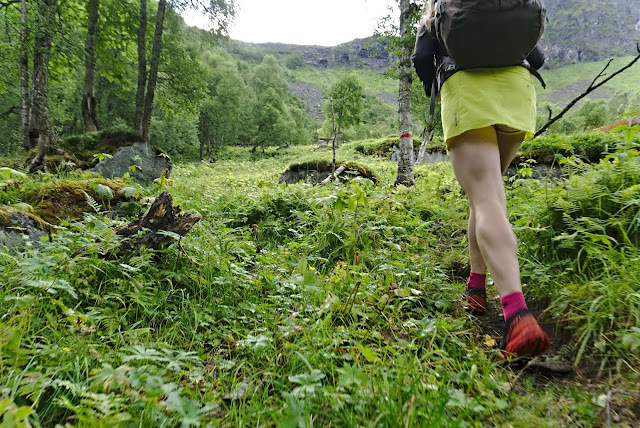 The scariest moment came on the way down, when the trail suddenly veered right. I was ahead of Audun and decided to stop after I rounded the corner and take a picture as he came towards. But he never came. Just before the right turn where we lost each other. Audun was headed straight down for the lake. Photo: Audun. That evening we stayed at Kongsvold, a mountain hotel on Dovrefjell. In 2011, Audun was working in Oslo and I in Trondheim, and we met up at Kongsvold to ride mountain bikes (which we realized belatedly is illegal in the national park, so don't do that!). We were students and I had just spent all my savings on a mountain bike, so of course we were tenting out. It absolutely poured rain that evening, and we went inside the reception at Kongsvold hotel just to spend a few minutes in a less cramp locale then our tiny, two-person tent. Kongvold serves really fancy food. I remember looking at the menu and resolving that someday we would come back and eat here. And what better time than our honeymoon?! We had 7 courses and it was delicious, but somehow I missed staying in a tent. 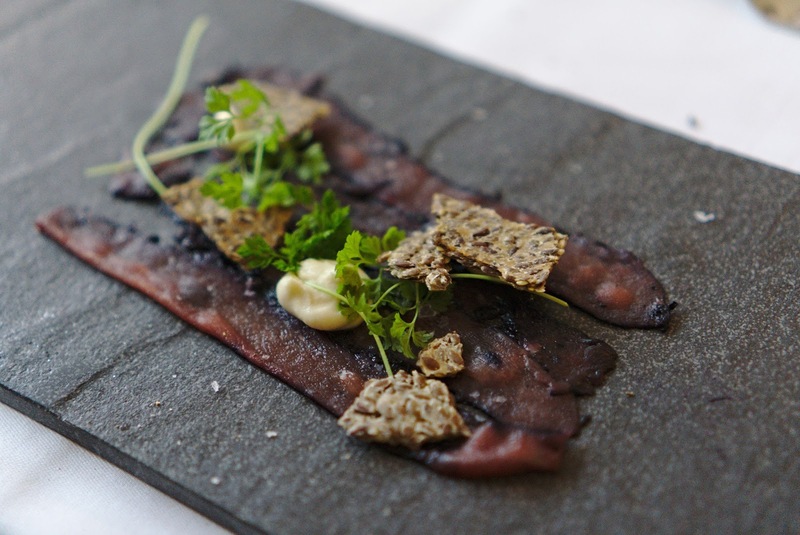 A taste of muskox meat at Kongsvold. 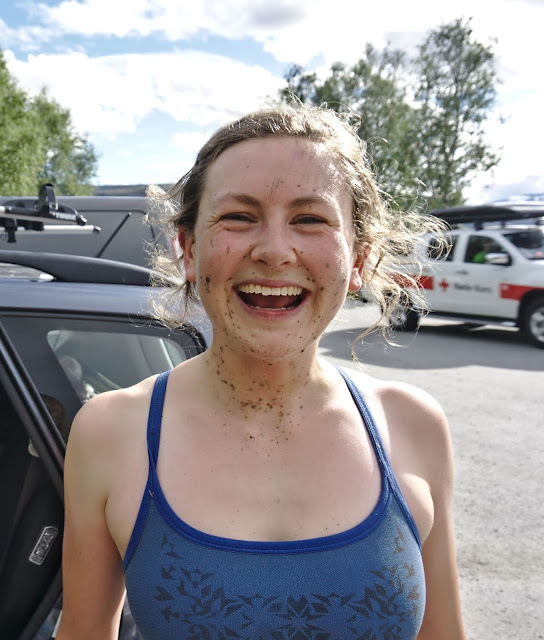 The next day we drove into the nearby town of Oppdal to take advantage of the sun and ride some trails. 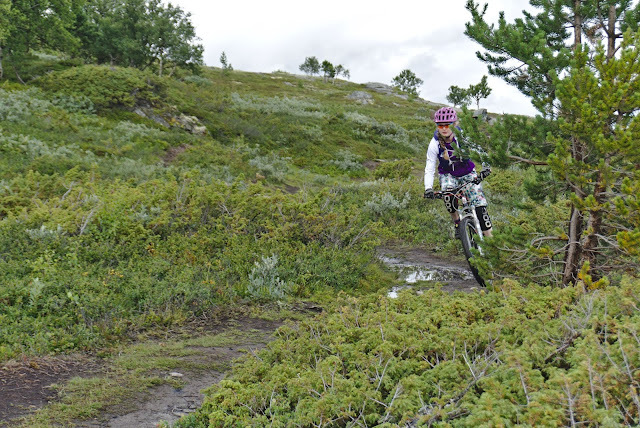 We started out the day on Svarthaugen, a nice and easy out and back trail that took us to a view point and provided some fun, not too challenging downhill riding. Audun on the way up Svarthaugen. Since I was focused on training for Jotunheimen Rundt this spring, I've barely touched my mountain bike. It takes some time to get back into the swing of things! Descending Svarthaugen. Note the puddle I am cleverly avoiding. 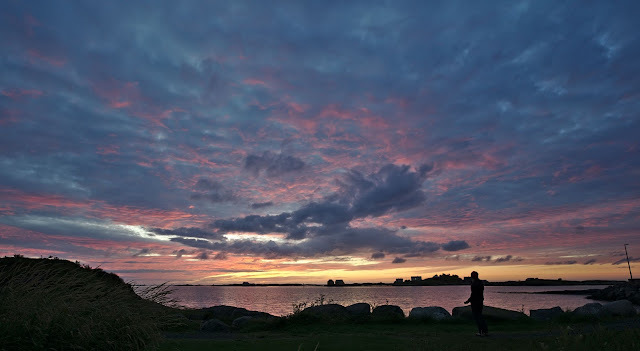 Photo: Audun. A rain shower passed over Oppdal as we were inside eating lunch, but then the sun came back and we decided to revisit Raudhovden, which was where Oppdal Enduro was held a couple years ago. Casper on the summit of Raudhovden, with Gjevilvatnet lake and Trollheimen in the background. We took an easy way up - almost everything was rideable. After a first technical section off the top, everything was flowy, fast riding downhill. Wall-riding some slabs on the descent. Photo: Audun. 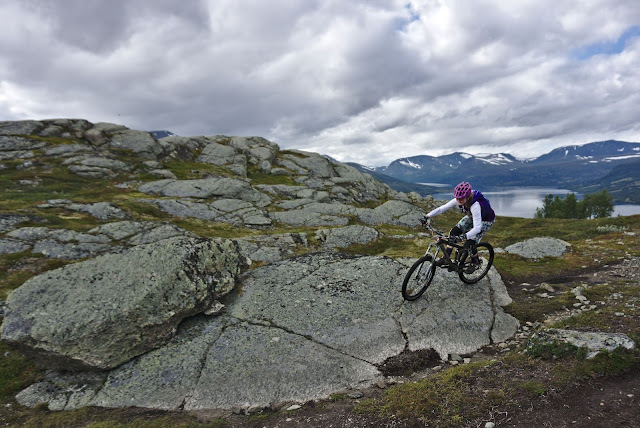 Elated by the great mountain biking in Oppdal, we decided to try our luck on Sjurvarden, the mountain we were blown off of in 2014. The forecast was for east winds, which should be milder on the coast. We drove out to the coast and I scoured maps and satellite images, looking for a good campsite. I noticed the tiny island of Kråkholmen, connected to the mainland by a bridge. Zooming in on the satellite images, it looked like there were a couple of houses and a whole lot of grass. We decided to drive out to Kråkholmen and look for a quiet corner to pitch our tent. 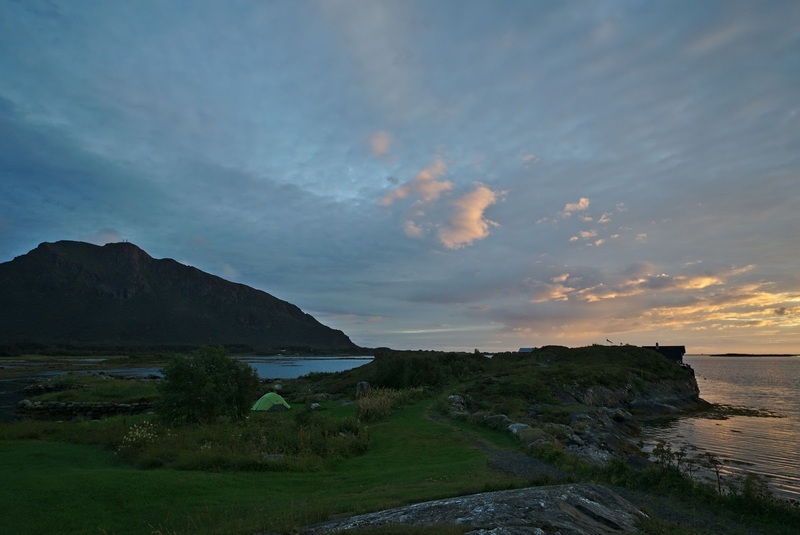 Kråkholmen turned out to have amazing tent sites. Someone had cut back a lot of the natural, bumpy heather and sowed and manicured smooth grass, perfect for pitching a tent. And then there were the views. Sjurvarden, the mountain we planned to ride, on one side, and the open sea on the other. The sunset gave us a real show, and we spent a quiet evening watching the sky evolve, enjoying just being. Great pics, but a little scary too!